To confirm price changes: if the start of a trend is not accompanied by an increase in volume it is considered to be weak and lacking commitment. To anticipate changes in price: increases in volume often precede changes in price. See Accumulation and Distribution for more detail. 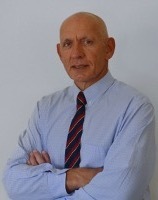 Rising prices and rising volume signal a healthy up-trend. Falling prices and rising volume signal a healthy down-trend. Rising prices and falling volume signal trend weakness. Falling prices and falling volume may signal trend weakness. See Low Volume in Down-trends for further details. A large range with low volume indicates a lack of interest from sellers (if price is rising) or buyers (if price is falling). Higher peaks with higher volume at peaks signal a healthy up-trend. 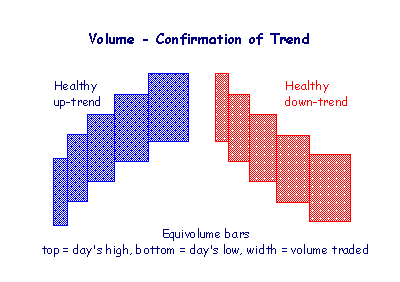 Lower troughs with higher volume at troughs signal a healthy down-trend. Higher peaks with lower volume at peaks signal that the up-trend is weakening. Lower troughs with lower volume at troughs signal that the down-trend is weakening. Accumulation and distribution indicate who is in control of the market and often signal a reversal. Trading ranges represent longer term accumulation or distribution. Accumulation is when the market is controlled by buyers. A down-trend that stalls while volume remains high signals that accumulation is taking place. Sellers have lost control to buyers and a reversal is likely. After trending downwards, there is little or no price movement and an increase in volume. Distribution is when the market is controlled by sellers. An up-trend that stalls while volume remains high is a sign that distribution is taking place. Buyers have lost control to sellers and a reversal is likely. After trending upwards, there is little or no price movement and an increase in volume. High volume immediately after the breakout indicates a healthy breakout. Low volume immediately after the breakout indicates weakness. 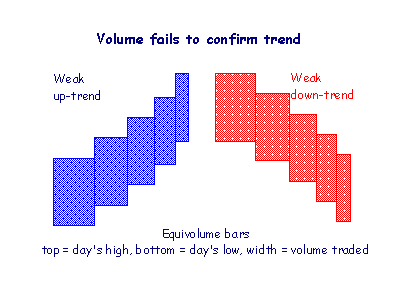 Low volumes do not necessarily signal the end of a down-trend. Commitment from buyers is necessary to drive up prices. Prices can fall due to a lack of interest from both buyers and sellers.